I was living on a small tropical island in the Philippines at the time, and I was broke. ​With $119.37 left in my bank account, I was desperate. 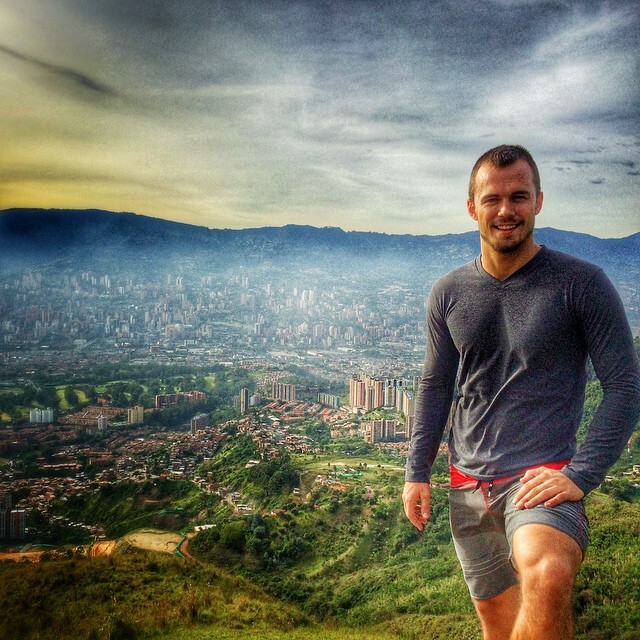 I was stranded in a foreign country with almost no money... I didn't speak the language, and I couldn't afford to buy a plane ticket home. 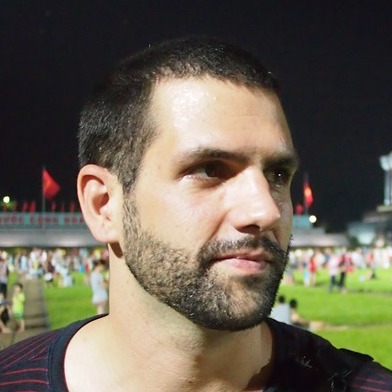 One day, I found myself talking to Dan Andrews (from TropicalMBA.com) at the resort where I lived. He'd heard I was studying copywriting, and said he needed someone smart to write an email autoresponder sequence for him (an "email autoresponder sequence" is a ​series of 5, 10 or any number of emails, organized into a sequence, usually with the goal of selling a product or service). Dan offered me $200 to write 10 emails for his business. I mean, who in their right mind would pay cold hard cash for... emails? Being desperate and stranded in a foreign country with no money, I stammered out a "yes" and got to work. Over the next 2 days, I worked all day and almost all night (like I said, I was desperate) to create a 10-email autoresponder sequence for Dan's Tropical MBA website. I used every strategy, trick and hack I could think of... I wanted these emails to be absolutely incredible. Once he was satisfied with the emails, I created a landing page and a link on his website for people to sign up to get the 10 emails. And then, we waited for the results. In the end, my 10-email autoresponder campaign and opt-in funnel increased their email opt-ins by 257%. 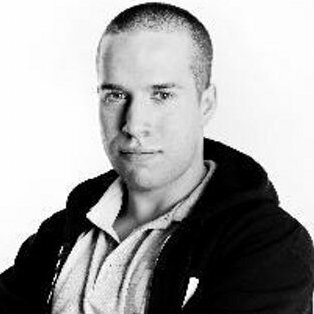 John increased our email opt-in rate by 257%. Hire him. He's great. More leads meant more sales and more money.​..
Dan eagerly told his friends and network about the great results I'd gotten for him. Thanks to Dan's referrals, that first 10-email project for $200 brought me my second 10-email project... but the second time, I asked for $500 (and got it). Over the next few months, I kept my head down and worked hard, striving to make every email campaign and copywriting project a big win for everyone involved. I was getting paid $1,000 per 10-email project. My clients came to me... I didn't have to seek them out. 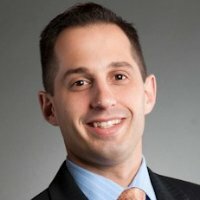 Thanks to the copywriting work I'd done with Dan Andrews at TropicalMBA.com and several other key clients, I'd built a reputation as "The Autoresponder Guy". People recommended me on webinars, at conferences, to their friends, mentors, and clients. ​Since then, I've increased my rates even further. These days, I generally charge $10,000 or more for email copywriting projects (and that's if I even accept the project - I turn down most projects because I can't keep up with the demand). So life is good.​ Really good. (once known as the "Murder Capital of the World"). I can live and work anywhere in the world. In the last 5 years, I've lived in the Philippines, Thailand, the US, Canada, Colombia, and Germany. I've traveled to many more places including the British Virgin Isles (to meet Richard Branson on his private island), Cambodia, Laos, Hong Kong, Singapore, Portugal and many more. I'm free to pursue hobbies, passions and other interests. 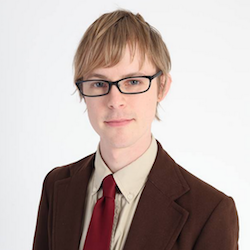 Freelance copywriting has allowed me to explore the start-up world of Silicon Valley, meet interesting people like Richard Branson, travel the world (like I already mentioned), work on my music (I've been a guitarist for 15 years), read amazing books, and all sorts of other things. 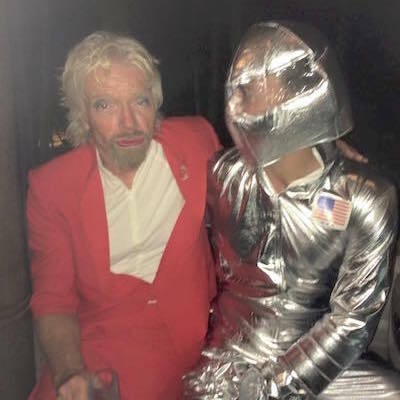 Playing "dress ups" with Richard Branson (Virgin) at a party on Necker Island, his private island in the Caribbean. 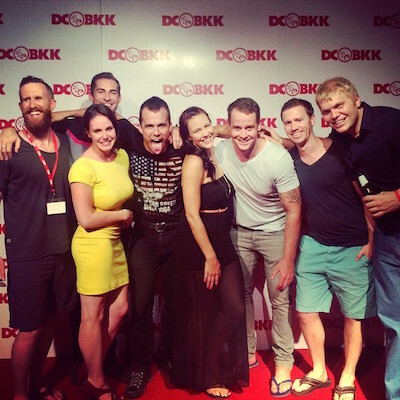 Partying with friends in Bangkok, Thailand. I enjoy more quality time with friends and family. Thanks to the freedom that comes with freelance copywriting, I enjoy more quality time with friends and family. And when I'm with them, I'm not distracted by work. I'm present with them, because I'm not thinking about the frustrating boss or the commute to the office. I get to work at home too (yes, in my underwear if I wish! ), so I'm simply available more for the people I love. Now, I want to show YOU how to write emails the way I write emails, so you can experience some of this amazing freedom for yourself... that's why I created the McIntyre Method. In the McIntyre Method, you'll discover the exact process I follow to create 10-email autoresponder sequences for clients (as well as the exact email templates and sales scripts I've used to sell 10-email packages for $200 to $5,000+). I can't promise you that you'll be able to sell 10 emails for $1,000, or even $200. But what I can promise you is that you'll discover the recipe behind my client projects. 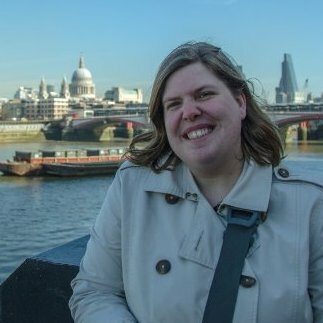 What I write, and how I sell it. And you'll be able to apply this to your own business, and to your own work with clients. Think of it as a "done for you" copywriting service that you can sell to any and all of your clients, for as much or as little as you wish. It's not all theory either. You get checklists, templates and homework assignments (including the exact email templates and sales scripts I've used for 5+ years to build my copywriting business). The idea is to get you DOING something... actually WRITING emails so you truly learn how to do it (instead of having that useless form of knowledge known as "head knowledge"). You'll finally be able to "walk the walk" when it comes to email copywriting. Are You Frustrated Because You Never Finish Any Of The Business And Marketing Courses You Buy? In my time as an entrepreneur and freelance copywriter, I've bought my fair share of business and marketing courses that I've never finished. One day, I realized that if I don't finish and implement what I learn in a business or marketing course, the problem usually lies with the course - not with me. Have You Ever Noticed How Some Business And Marketing Courses Are EASY And SIMPLE To Complete? That's why I believe it's the course creator's responsibility to design it in such a way that you COMPLETE the course and IMPLEMENT what you learn. ​Well, you'll be glad to know that I've designed the McIntyre Method Masterclass with this in mind. You get everything in bite-sized pieces so you actually understand what you're learning - instead of being overwhelmed by it. In addition, you'll complete checklists, outlines and specific homework assignments throughout the masterclass that help you implement what you learn. You don't just watch a few videos, complete some homework assignments and then go find the next course out there on the interwebz. You'll literally take what you learn in each masterclass lesson and APPLY IT IMMEDIATELY - with the end result being a 10-email autoresponder that you've written yourself. I take you by the hand and walk you through the exact process I use when writing email autoresponders for clients, from start to finish. By the end of the 4 weeks, you'll have written a 10-email autoresponder sequence that you can sell to clients or use to grow your own business. ​Plus, you'll also have access to the EXACT email templates and sales scripts that I've used to sell 10-email packages to clients for $200 to $5,000 or more. Don’t let the idea of “4 weeks” scare you off. You’ll spend just 2-4 hours per week watching the videos and completing the tasks each week. Plus, you get access to the entire course immediately, so you can do it at your own pace - as fast or as slow as you wish. So whether you're unemployed and have all the time in the world, you've got 3 kids or you work 40+ hours a week, you can find the time to fit in the McIntyre Method Masterclass. I've read Dan Kennedy and all those guys but it's *a lot* of material. The McIntyre Method takes the complex and makes it easy to digest. So What Does This Email Copywriting Masterclass Actually Cover? If you're struggling with copywriting, it's probably because you don't understand the big picture of marketing as a whole. It sounds simple, but the fact is, this is where most people fail. 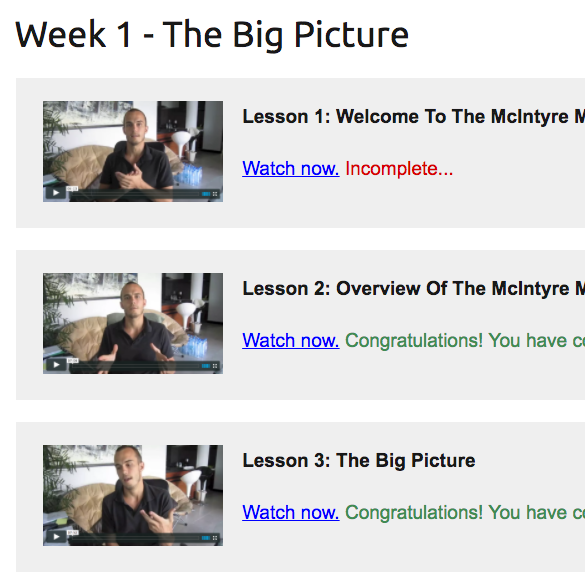 That's why the McIntyre Method Masterclass begins with The Big Picture. What is the most important element of writing an autoresponder? Your outline is your map. It takes you from Point A (where you are now – not enough sales or money) to Point B (where you want to be – truckloads of sales and money). Without a detailed map, you’ll get lost, go off course and end up some place you didn’t intend on getting to. If you understand the big picture but still struggle with copywriting, it may be because you haven't developed a detailed outline based on the core McIntyre Method principles. It’s time to put pen to paper and turn your outline into a hard-hitting, high-converting autoresponder that drives sales on autopilot - for you AND for your clients. Should you send daily emails? What tone of voice do people respond to most? How often should you put links in each email? Plain text or HTML – what’s the verdict? How long should each email be? In the final week, you'll put the pieces together. You'll sign up to a recommended autoresponder service and add your emails (or if you're doing this for a client, you'll add their emails into their email software). Next, you'll create a landing page, begin driving traffic and - if you've followed the McIntyre Method steps correctly - you'll see signups and sales. What email autoresponder service should you use? Where should you put your opt-in form? Do blog sidebar opt-in forms work? Did You Know That This Masterclass Includes The Exact Email Templates and Sales Scripts I've Used To Sell 10-Email Packages To Clients For $200 to $5,000+? Past customers say that the great thing about the McIntyre Method Masterclass is that it includes the exact "word for word" email templates and sales scripts I've used for years to run my freelance copywriting business. ​Plus, you'll also get 3 "real life" examples from my own clients. Yes. I'm literally going to give you the exact 10-email autoresponder sequences I created for 3 separate clients. You'll be able to download these and review them in detail to see exactly what people are paying me for. ​In other words, you get "word for word" templates and scripts (that have been battle-tested in my own business) you can use to run your copywriting business, plus "real life" examples of my copywriting projects so you understand what clients pay for. ...I'm also going to give you an 8-video training course called How To Get Email Copywriting Clients. This course explains my 7-step process for getting email copywriting clients. While it's designed with email copywriting clients in mind, the process can be used to find clients for any type of copywriting product or service (such as sales letters, sales funnels, webinars, etc). The McIntyre Method Masterclass gives you the skills to write powerful, persuasive emails. How To Get Email Copywriting Clients shows you how to sell your newfound email copywriting skills​ to clients for $200 to $5,000+. Lastly, the email templates and sales scripts save you time and massively shortcut the learning process. Hey John, loving MM man. The structure you have set up is great. I'm even more impressed by your willingness to share your info. There's no 'secret' in MM. It's pure balls-to-the-wall, sound copywriting advice that anyone can and should follow. Get all lessons and course material. The masterclass homepage includes every lesson (31 lessons in total). It updates as you complete lessons and modules, so you know exactly where you're up to in the course and what's remaining. Stay motivated with the progress bar. Track your progress with the auto-updating progress bar inside the member's area. You'll know how much you've accomplished, and how far you have to go. 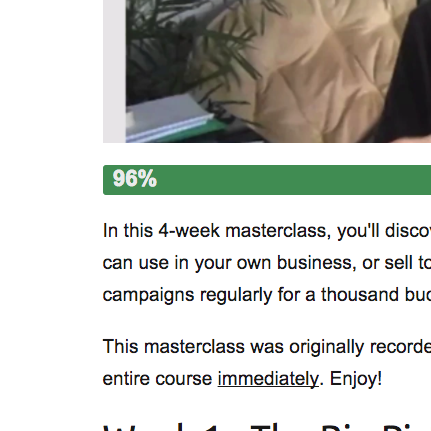 The progress bar makes you more likely to actually complete the masterclass (so you improve your email copywriting, get more clients and make more money). Mark each lesson as complete. When you have completed a lesson, click "Mark Lesson As Complete" and you'll be automatically redirected to the next lesson. Easy and simple. Eliminates distraction. Keeps you focused. Get audio, PDF transcripts, templates, checklists and homework assignments. Each lesson includes a PDF transcript (if you prefer to read), MP3 download (if you prefer to listen), as well as checklists, outlines, templates and homework assignments. On each lesson page, you have the opportunity to ask a question or comment. If you're confused about something, or you want feedback on an idea, simply post a quick comment and get your answer. Well sir, the split test is in and your recommendations increased the conversions by about 19%, so I bow to you and your copy knowledge. I was able to use what I learned in the course to help with fundraising for a school client - $15k in 25 days, which may not sound like a lot, but for this school it is a big deal. LOVE your stuff and LOVE the masterclass! DAMN! Your Spielberg email rocks! Sent it to my list the other day and got 3 ebook sales! LOVE your stuff and LOVE the masterclass! John McIntyre’s Masterclass is awesome. In the first week after I watched his free webinar, I used his strategy to generate $600 in one week (3 sales)... and that just from his free webinar! With the advice he gave, I made just under $2,000 with a couple of emails. I came across the McIntyre Method Masterclass in August. Now, I went through the course. I find that the style really resonated with me. I followed John’s advice pretty much word-for-word. I set it all up. 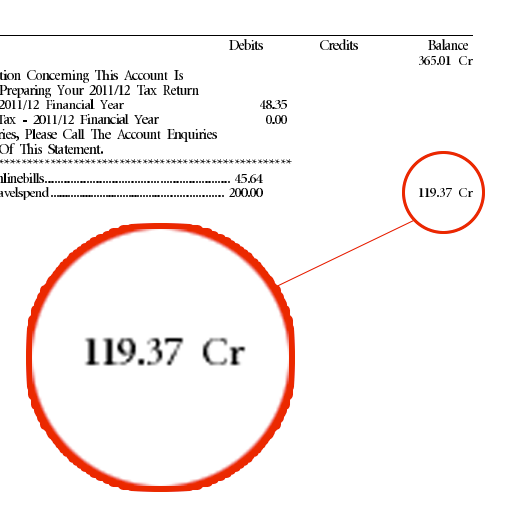 And to make a long story short, last month, I made four figures for the first time through my e-mails. In fact, I made about $1,200 or something like that, which is not a massive amount of money, however, it is more than enough to fund my scientific research. That’s what the McIntyre Method did for me. I am pretty confident that it will do the same for you. No matter what niche you’re working in. No matter what kind of business you’ve gotten going. I’m pretty sure the McIntyre Method will work for you. My recommendation to you, as I said, is one, buy the course. Two, actually do and listen to what John says. I can 100% vouch for the McIntyre Method. I wasn’t expecting optins to go from 10ish a day to 45 and 30, but it did! Holy ****. THANK YOU!! You’ve just set me up with autoresponders for a year. What’s more I will be implementing it TODAY. I’m now so excited I can’t type fast enough. It remains to me to say a big thank you John - and it goes without saying that if you ever want any brain fuel recipes for those long workdays when you’re not in a coffee shop, well, you have only to ask. I mean it. Thank you! 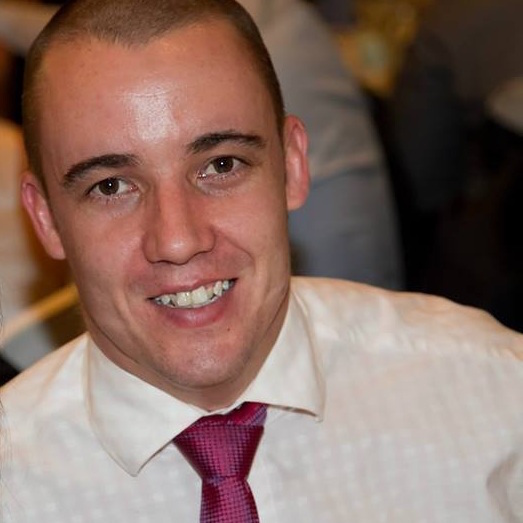 "Buy the McIntyre Method Masterclass and DO what John says..."
"Highly recommended if you want to grow your business through your email list instead of a website that sits there and does nothing..."
"John McIntyre's Masterclass is AWESOME. I generated $600 in one week, and I haven't even completed my email autoresponder..."
himself. That's what makes him different." The McIntyre Method Masterclass is just me on screen, explaining the process I use to write email autoresponder sequences for clients. So if you’re expecting HD video of a professional speaker in a suit-n-tie running around a stage like a motivation guru then this program isn’t for you. My focus is on quality content delivery only. If that’s cool with you, you’re going to get a ton of value out of this program. Copywriting For Conversions is an audio-only training course that teaches you exactly how to write copy that converts. Whether you want to write an email, a sales page, a landing page, an about page, or anything else, Copywriting For Conversions will give you the tricks and tools to write copy that makes clients beg for more. The proof of the McIntyre Method Masterclass, of course, is in the results it produces for YOU. That’s why you can go through the training AT MY RISK. Watch the videos. Do the assignments. Apply the McIntyre Method formula. And if you are anything less than simply delighted with your results, send me a quick email within 30 days and I’ll refund your money in full, no questions asked. Be astounded by the results it produces for you. Experience the increase in bottom line revenue. See the thankful emails you receive from customers. It is never too late to build a relationship with your list. It’s never too late to build an automatic sales machine. The opportunity is here, on this page, in the order form below. Why not sign up – at my risk – today! Includes all course content, plus 12 coaching calls with John. Includes the McIntyre Method Masterclass, plus ALL bonuses. Includes the McIntyre Method Masterclass, but no bonuses. I'm impressed by your willingness to share your info. 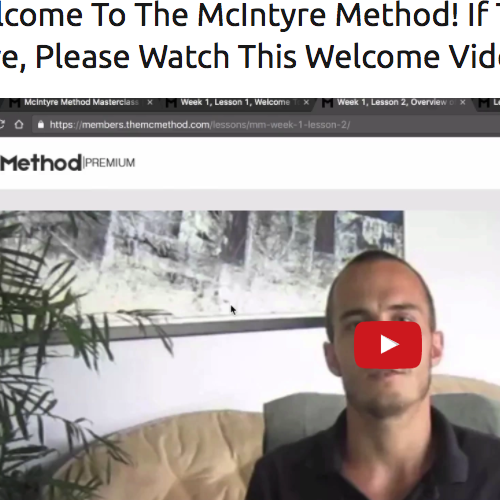 What is the McIntyre Method Masterclass? The McIntyre Method Masterclass is a 4-week email copywriting masterclass. In 4 weeks, you'll create​ a 10-email autoresponder sequence that you can sell to clients for $200-1,000 or use to grow your own business. My first client paid me $200 for 10 emails. My second client paid $500 for 10 emails. Soon after, I was charging $1,000 for 10 emails. 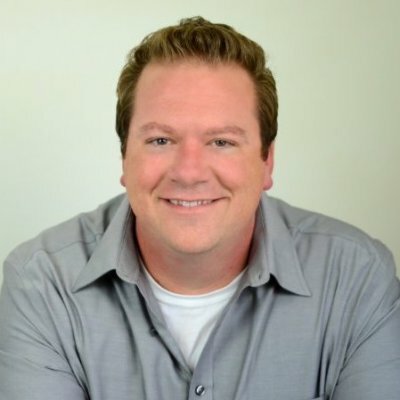 Since then, I've charged upwards of $10,000 for email autoresponder sequences. In this McIntyre Method Masterclass, you'll discover the exact process I use to write emails for these types of clients. Plus, you'll also receive the same email templates and sales scripts that I've used to run my freelance copywriting business for years. While I can't guarantee that you'll get paid as much as I do, I can say that the masterclass will improve your copywriting and make you more valuable to your clients (or if you have your own business, you'll be able to grow it via email marketing). Your career will progress faster, and you'll probably find that clients and business owners come to you for advice. 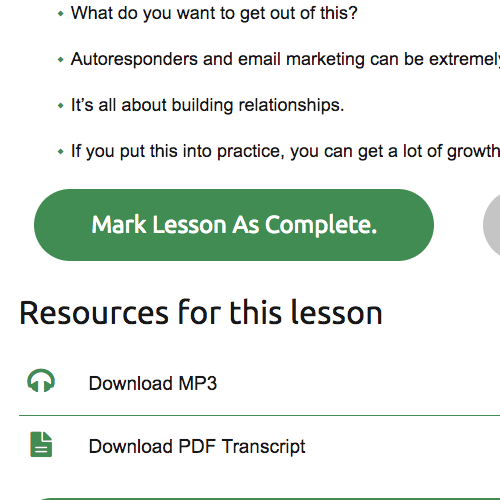 The masterclass doesn't just give you the theory... it gives you homework assignments so that upon completion, you'll have a 10-email autoresponder sequence that you've written yourself (along with my time-tested email templates and sales scripts for getting email copywriting clients). Everything I offer has a 30-day, no-questions-asked guarantee. In other words, if you aren’t happy for any reason, just let me know and I’ll give you your money back. I obviously don’t think it’ll come to that, but if you’re even the least bit worried if this will work for you, put your mind at ease. You'll get instant access to the entire course after completing payment. That's instant, lifetime access to ALL​ content... immediately. That's all lessons from the McIntyre Method Masterclass (26 lessons), all lessons from the BONUS course Copywriting For Conversions (5 lessons), all lessons from the BONUS course How To Get Email Copywriting (8 lessons), as well as the email templates and sales scripts I use to run my freelance copywriting business. Is it a beginner friendly course for those who are aspiring to become a freelance email copywriter? Yes. It's designed with beginners in mind. It also now includes a bonus called How To Get Email Copywriting Clients so you can take what you learn in the masterclass and get your own email copywriting clients. In addition to the bonus course, you also get the exact "word for word" email templates and sales scripts that I've used to sell 10-email packages for $200 to $5,000... so you won't have to figure out the sales process yourself either. If you're a completely new copywriter (as in, you've NEVER written a word of copy), you'll be glad to know that you'll also get access to Copywriting For Conversions, another bonus course that explains how to become a good copywriter. You'll need to do the homework and exercises, but I promise you that IF you do, you'll become a great copywriter. It's the same step-by-step process I followed. Please note: How To Get Email Copywriting Clients and Copywriting For Conversions are included FREE when you sign up for the McIntyre Method Masterclass. How is the McIntyre Method Masterclass different to other copywriting courses? Most courses overwhelm students with copious amounts of theory, but rarely getting down to action. As a result, most students and aspiring copywriters feel overwhelmed, stuck and unable to move forward. It doesn't just give you the theory... it gives you homework assignments so that upon completion, you'll have a 10-email autoresponder sequence that you've written yourself. This includes checklists, templates, surveys, and more (such as the exact sales script that I've used for years on my sales calls). No more wondering what to write. No more staring at the cursor. Once you've completed the masterclass, you can sell 10-email autoresponder packages to clients and use email copywriting to grow your own business. Why 4 weeks? What if I want to do it fa§ster or slower? It's called a "4 week" masterclass because the lessons were originally recorded and released over 4 weeks. However, when you sign up today, you'll get immediate access to ALL of the lessons from ALL of the weeks. ​You can race through the entire masterclass in 1 week, over 4 weeks as it was originally released, or in any other timeframe you desire. How much time do I need to complete the masterclass? You'll need 2-4 hours per week to watch the videos and complete the homework assignments. However, as I mentioned previously, you don't need to do this week-by-week for 4 weeks. When you sign up today, you get immediate access to the ENTIRE masterclass (including the bonus - Copywriting For Conversions). You can race through all the lessons in one action-packed week, you can take your time and do it all in 3 months, or you can do it in any other way you desire. Therefore, whether you're unemployed and have all the time in the world, you've got 3 kids or you work 40+ hours a week, you can find the time to fit in McIntyre Method Masterclass. What will I learn in this email copywriting masterclass? If you understand the big picture but still struggle with copywriting, it may be because you haven't developed a detailed outlined based on the core McIntyre Method principles. Track your progress with the auto-updating progress bar inside the member's area. You'll know how much you've accomplished, and how far you have to go. The progress bar makes you more likely to actually complete the masterclass (so you can get the results you desire). When you have completed a lesson, click "Mark Lesson As Complete" and you'll be automatically redirected to the next lesson. Easy and simple. Eliminates distraction. On each lesson page, you have the opportunity to ask a question or comment. So if you're confused about something, or you want feedback on an idea, simply post a quick comment and get your answer. Can you give me some examples of autoresponders? Yes. The McIntyre Method Masterclass now includes 3 "real life" examples from my own clients. Each of these clients hired me to create a series of 10-emails (paying thousands of dollars), and you'll be able to download these email packages inside the Masterclass Member's Area. Do you have any testimonials or case studies? Hey John, loving MM man. The structure you have set up is great. I'm even more impressed by your willingness to share your info. There's no 'secret' in MM. It's pure balls-to-the-wall, sound marketing advice that anyone can and should follow. Is this a professional video production? What sort of quality can I expect? A word of warning: this ain't no fancy production. What will I learn in the BONUS training 'Copywriting For Conversions'? Do you offer email copywriting and consulting services? After successful completion of the Masterclass and with proper marketing, could I confidently offer email writing as a freelance service in a profitable niche? Upon completion of the Masterclass and with proper marketing, you can offer email copywriting as a freelance service. 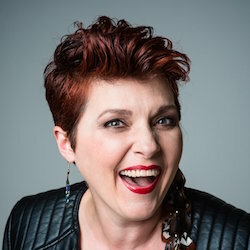 Past customers say that the great thing about the McIntyre Method Masterclass is that it includes the exact email templates and sales scripts I've used for years to run my freelance copywriting. ​Plus, you'll also get 3 "real life" examples from my own clients. I'm literally going to give you the 10-email autoresponder sequences I created for 3 separate clients. You'll be able to review these in detail to see exactly what people are paying me for. ​In other words, you get "word for word" templates and scripts (that have been time-tested in my own business) you can use to run your copywriting business, plus "real life" examples of my copywriting projects so you understand what clients pay for. Plus, you also get the How To Get Email Copywriting Clients, a 8-video course on - you guessed it - how to get email copywriting clients. ​So, it's safe to say that you'll have the tools you need to get out there and land some email copywriting clients. However, please remember that results vary between customers as everyone starts from a different place, with different goals, different skills, and different strengths and weaknesses. "If you regularly stare at a blank page with fear and dread, then the McIntyre Method will help you." Can You Afford To Put This Off Any Longer? Look. The name of the marketing game is relationships. Seth Godin says it. So does Jay Abraham. Marketing geniuses, both of them. If they keep saying it, isn’t it time you jumped aboard the train? This train is leaving. Leaving for riches. It’s going with or without you. Climb aboard and make your way to business success. Or stay where you are and continue to stagnate in mediocrity. Email is still the best relationship tool in a marketer's arsenal. With thousands of competing marketing messages, people are ruthlessly eliminating junk. Despite this, we’re using email more than ever. If you have someone’s email address, you have direct access to their home. Your emails will get noticed beside emails from their mother and their best friend. That’s why email works. Because it puts you on an equal playing field with your prospect’s mom. With their family. With their friends. If your prospect enjoys your emails, you become part of his family. That’s what the McIntyre Method gives you. A ticket into your prospect’s living room. Into his home. Into his inbox. Into his family. Use it for your business. Use it with your clients. If you are anything less than delighted with your results, send me a quick email within 30 days and I’ll refund your money in full, no questions asked.